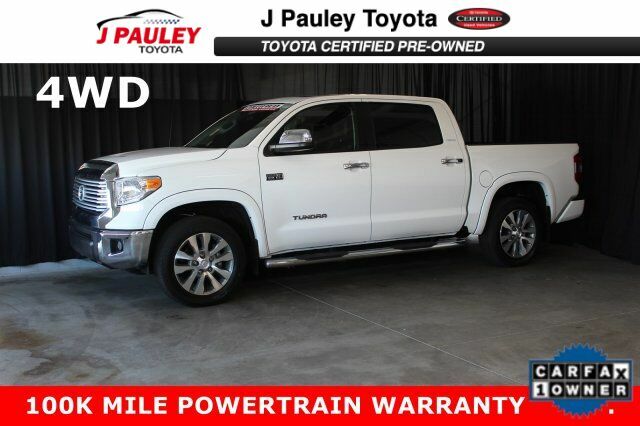 This certified 2017 Toyota Tundra 4WD Limited is a single owner vehicle with a CARFAX free of accidents and damage. It features the following options: 4 wheel drive, exterior side steps, tow hitch, premium alloy wheels, power locks, power windows, leather interior, AM/FM radio, CD player, AUX input, USB port, multiple power sources, GPS navigation, backup camera, sunroof, heated front seats, cruise control, Bluetooth, blind spot monitor and keyless entry. Test drive this vehicle at J. Pauley Toyota-Scion, 6200 S 36Th St, Fort Smith, AR 72908.